Pioneer Creek Golf Course offers a variety of club and league options, each of which offers a different mix of friendly competitive play, social opportunities, and regularly scheduled golf outings. Click on a league/club option, below, that might interest you to get further information. Contact the Pro Shop or complete an enrollment form (where available) to get involved. Some of the league/club options available are aligned with local or national golf organizations and may offer participation at higher levels of play. 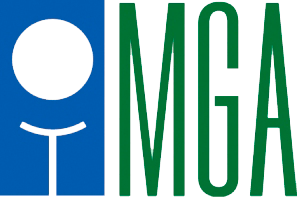 The MPGA and MGA are excellent examples of these organizations. Peruse through their websites by clicking on their logo below. "Pioneer Creek is a wonderful golfing experience. From the moment you enter the parking lot, to the end of your round, you feel like this was the best day of your life. Whether you walk or ride, the scenic and challenging layout with its rolling hills will enhance your round and beckon you to return. The senior golfers are competitive, friendly and share the same goal you have - an outstanding round at Pioneer Creek! Everyone from the owner to the professionals in the golf shop to the beverage cart personnel work hard to provide the best service to compliment your golfing experience." "Want to play in a golf league this year but can't commit to every week? I know a league that will work for you. The Thursday afternoon/early evening Men's League at Pioneer Creek will fit your needs. This is a nine hole league with a pay as you go format. There are no large up front costs for golf. No finding your own sub or making up matches due to rain outs, you just take care of yourself. You are probably less than 20 minutes from the course and didn't even know it." “We really enjoyed the pot luck dinners that followed the weekly golf events. The food was great and it was a nice getting to meet the other couples”. “The weekly events were fun and the flexible tee time schedule allowed us to play a little later than some of the other couples”. “Incorporating handicaps into the scoring of the events allowed more couples to win the weekly events”. “We have been in the couples league for 2 years and we have always enjoyed the company of the other couples, the different weekly events and the pot luck dinners”.